As a charitable organization, Just Neighbors relies on the generosity of individuals, churches, local businesses, foundations and other charitable organizations to fund its community outreach activities. Donations of funds in any amount, at any time, are always needed and appreciated. 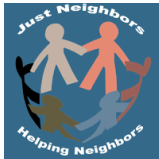 SInce Just Neighbors is a registered, not for profit 501(c)(3) organization (EIN: 201457310), your donation is fully tax deductible. Click the Donate button below to make a donation via PayPal with your credit card, debit card or PayPal account. You can also contribute by mailing a check payable to 'Just Neighbors' to the address below.